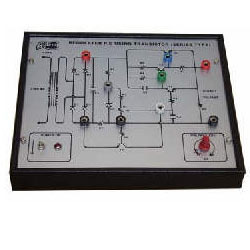 Pioneers in the industry, we offer power supply using zener diode trainer, power supply using transistor trainer, power supply using ic 317 trainer and switch mode power supply trainer from India. 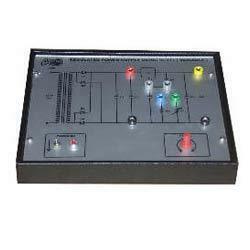 We offer the optimum quality of Power Supply Using Zener Diode Trainer to our valued patrons. 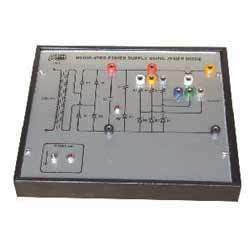 Used to study construction and working of power supply, the offered power supply trainer is ideal as both demonstrator or experimental purposes in schools and colleges. We accurately deliver the offered power diode at the customer’ end, due to wide distribution network. Demonstrates the principle of construction and working of a regulated power supply using zener diode. Built-in two zener diodes with respective current limiting resistors. Determination of load regulation and ripple factor. Test points at various stages in the circuit, enable to observe the waveforms and voltages set of patch cords. Strongly supported by a comprehensive instruction manual complete with theory and operation. Keeping the updates of latest happening in this domain, we manufacture and supply the best quality of Power Supply Using Transistor Trainer. The offered power supply using transistor trainer is used to study the construction and working of DC based power supply. Its robust construction, make this power supply using transistor trainer highly demanded. Demonstrates the principle of construction and working of a series type DC regulated power supply. Measurement of basic parameter of a DC regulated power supply. 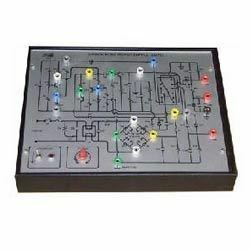 Test points are provided at various stages in the circuit to observe the voltage and waveforms. Owing to our rich knowledge of this domain, we offer the finest quality of Power Supply Using IC 317 Trainer. Rendered by us at cost effective prices, the offered trainer is used to demonstrate the working of power supply using IC. Our large power supply trainer production capacity has helped us in meeting the bulk demands. Completely self contained stand alone unit. Demonstrates the principle of construction and working of a regulated power supply using ic 317. Built-in voltmeter, and ammeter to measure voltage and current. Built-in short circuit protection and thermal shutdown. Measurement of the basic parameters of the variable regulated power supply using ic 317. Determination of line regulation load regulation and ripple factor. Test points at various stages in the circuit, enable to observe the waveforms and voltages. Strongly supported by a comprehensive instruction manual complete with theory and operation details. Economy model without built-in voltmeter and ammeter. Demonstrates the principle and working of a switch mode power supply. Measurement of basic parameters of a smps. +110v, +12v and +33v supply available at the output. Multi-coloured test points at various stages in the circuit to observe the waveforms and voltages.